South Africa and Zimbabwe have been urged to keep their socio, economic, cultural and political antennae in sync. 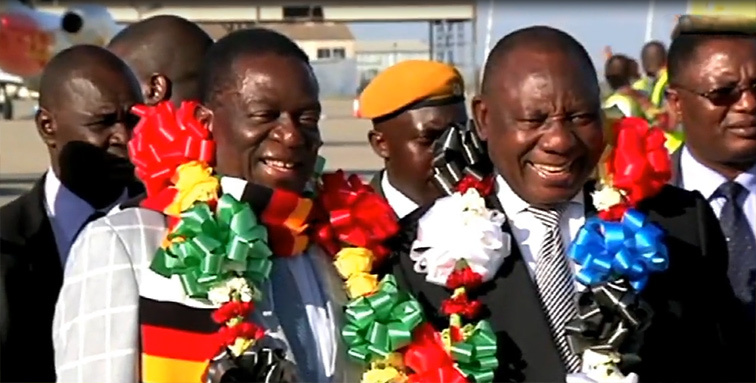 This as South African President, Cyril Ramaphosa arrives in Harare for the Bi-National Commission with his Zimbabwean counterpart, Emmerson Mnangagwa. The Commission is expected to deepen and strengthen relations between the two countries and unlock critical value for sustainable development. South Africa is Zimbabwe’s biggest trading partner. Zimbabwe’s economy is at a crossroads. According to the World Bank, Zimbabwe continues to face substantial currency risks because of fiscal mismanagement and this continues to weigh on investor confidence. Massive corruption and disastrous economic policies have also plunged the country into poverty. The Zimbabwean economy depends heavily on mining and agriculture but political instability and protracted economic under-performance threaten higher unemployment. And government’s failed economic policies and continuing control have distorted the labour market resulting in a large informal sector. Over the past 3 years, government spending has amounted to 29 percent of the country’s gross domestic product. And the current account deficit narrowed for 3 years in succession due to import restrictions and recovery in exports. The recently announced Transactional Stabilization Programme contains government’s plans to ensure financial stabilization and address the current liquidity challenges the country is facing. Many Zimbabweans have been priced out of the market for basic goods due to steep price hikes blamed on acute shortages of foreign currency. The country has recently developed a new currency called real time gross settlement dollars or RTGS dollar . The currency is expected to help promote exports and encourage investments . But economists say the currency can only be declared new once it’s price is stable, lower and accessible to the majority of Zimbabweans. The post SA, Zimbabwe to strengthen relations appeared first on SABC News – Breaking news, special reports, world, business, sport coverage of all South African current events. Africa's news leader..